Looking to buy recordable media products at “below wholesale” prices? 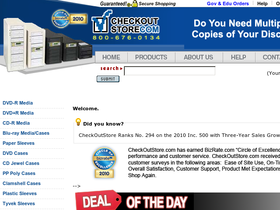 Stop searching and start shopping at CheckOutStore, online at CheckOutStore.com. This store offers the most competitive prices possible on media storage products such as CD-R, CDR, CD-RW, DVD+R, DVD-R, DVD-RW, DVD DL, DVD Dual Layer, LightScribe DVDs, and blue ray. Plus, also for sale are CD and DVD sleeves, holders, and cases. Merchandise at CheckOutStore comes from the highest quality brands including, but not limited to, Taiyo, Yuden, Prodisc, Ritek, Princo, HP, Philips, and Verbatim. Check out RetailSteal.com for all the hottest CheckOutStore discounts, CheckOutStore coupon codes, and CheckOutStore promotions. Shipping rates from CheckOutStore vary based on order pricing and shipping method chosen. Free shipping is available on some qualified items, but only to be shipped by ground within the United States. See website for details and more information concerning shipping. Enjoy a $10 discount at CheckOut Store using this coupon code on your purchase $150+. Click link now to shop and save. Get your DVD-R's from CheckOut Store and take advantage of up to 15% off. Shop online at CheckOutStore.com and enjoy free shipping on select items. At CheckOut Store, spend $30.00 or more and receive 100 Pack Paper CD Sleeves for free with the coupon code. Click link to shop. Use this coupon code at CheckOut Store and receive a free 200 pack of paper CD sleeves when you make a purchase of at least $50. Use our coupon code at CheckOut Store today to enjoy a free 300 pack of paper CD sleeves with any purchase of $75 or more.